I don’t think I’ve encountered a single Malazan fan who doesn’t think that the second book in the Malazan Book of the Fallen series, Deadhouse Gates, is better than the first. So I’m hardly being original when I say this, but it still has to be said. Deadhouse Gates is a much better book than Gardens of the Moon. And it’s not like Gardens of the Moon was a bad book, because it really, really wasn’t. Honestly I’m having trouble even identifying what it is about Deadhouse Gates that makes it seem so improved. This is going to sound ridiculously corny, but the only way I can describe it is to say that Deadhouse Gates has heart. I read Gardens of the Moon with half of my mind enjoying the story, and the other half analyzing it and trying to figure out what everything meant. As I said in my review of the book, to me Gardens of the Moon felt like a challenge. An enjoyable one, yes, but I was too busy trying to keep up to really immerse myself in the story. This was not even slightly the case with Deadhouse Gates. The book certainly no less challenging than Gardens of the Moon (sure, we know who a bunch of people and events are now, but Erikson goes ahead and dumps a crap tonne more on you, lest you start getting cocky). All I know if while I read Gardens with an analytical mind, I read Deadhouse Gates totally and completely involved in the story. I didn’t take nearly as close a note of all the comments and references, but weirdly I feel as though I followed this one better. There’s a scene, no spoilers here I promise, following a large battle where Erikson had me almost in tears. He had me felling truly wretched. And then only pages later there’s a scene where Coltraine is talking to the Malazan sappers (I'm sure anyone who has read the book will know what I'm talking about) and there I was with the huge, goofy grin on my face. I’m rarely very expressive when I read, but I think it would have been comical to watch my face while I read this book. Constant frowns and gasps and laughter. When I finished it I felt like I had run a marathon. I felt like I’d crossed the desert in Coltaine’s Chain of Dogs. In part because I normally average two books a week, and this thing took me almost a solid month to get through. But also because Erikson does not spare the reader at all. What his characters go through, you go through. And believe me, Erikson is not nice to his characters. While I think I need to break from the Malazan world to recover (and I mean that in the best possible way) I look forward to continuing on in this series. I especially can’t wait to see Erikson’s improved skills applied to some of my favourite characters from Gardens of the Moon, like Anomander Rake or Whiskyjack. Or Quick Ben. Or Palan. Or, oh, Kruppe! And we can’t forget Brood… And I wonder if we’re going to meet that Prince who’s heading the Crimson Guard? And what about Tattersail? And, and, and…. 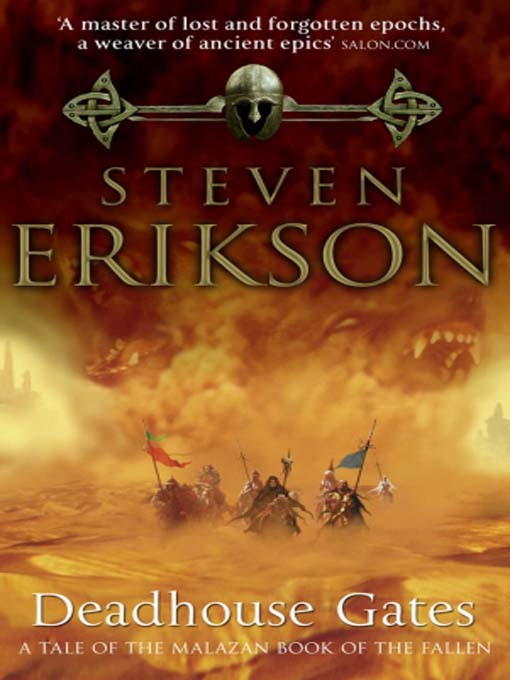 After finishing the whole series and the 4 Malazan books written by ICE, I am now re-reading everything. It's amazing to see how many details I have missed the first time or how what once seemed obscure now become crystal clear. It's also astounding to find that some importants events that occur in book 8 or 9 or 10 were hinted at every early in the first or second book. It shows a level of planning by Steven Erikson that just boggles the mind. This series is so great and reading it a second time make for an even better experience for this time I understand things much better. What I don't understand is that there are people out there who claim they can't even finish Garden of The Moon.